Democratically governed countries usually offer better conditions for long-term foreign investment than autocratic ones – particularly more stability, greater legal certainty and more efficient governance. Thus, from a company perspective, investing in democracies does not only feel right, it is also the more rational choice. The Chinese government is losing out – big time – on its high-stakes gamble. As commodity prices climbed steadily in the last ten years, Peking invested massively in poorly governed, authoritarian and often instable countries like Afghanistan, Angola, Burundi, Cambodia, the Democratic Republic of the Congo, Guinea Bissau, Laos, Myanmar, South Sudan, Tajikistan and Zimbabwe. Aiming to secure exclusive access to rare or in high-demand commodities, China aggressively sought to tap these countries’ natural resources in exchange for logistics and infrastructural investment. In the process, issues such as workers’ rights, environmental protection and good governance have been more or less ignored. China’s commodity policy is falling to pieces. The current low prices mean that the Chinese government is paying more for its investment policy than it would were it to purchase raw materials on the global market. Furthermore, some governments, such as that in South Sudan, have rolled back on supply commitments as a result of political instability. According to Rolf J. Langhammer at the Mercator Institute for China Studies, Peking must radically rethink its investment policy and pursue both multilateralism and compliance with social and environmental standards. What lessons might businesses draw from this example? That it’s worth thinking in the longer-term and taking a closer look at the quality of governance in a country you plan to invest in, to be sure. This is true in particular for issues such as stability (and the capacity of a government to diffuse tensions), the rule of law (and the government’s willingness to protect private property rights) and sustainability (and the government’s resource efficiency, including anti-corruption measures). First things first. Obviously, stability is a key factor influencing investment decisions. The Bertelsmann Stiftung’s Transformation Index (BTI) tracks several aspects of stateness in 129 developing and transformation countries, including a state’s monopoly on the use of force and the extent to which basic administration functions. It offers a good overview of stability in these countries. But stability alone is not enough. Indeed, developments such as the Arab Spring have shown that political stability, as well as a favorable and stable business climate, cannot be sustained forever in a country where social protest has met with brutal repression. 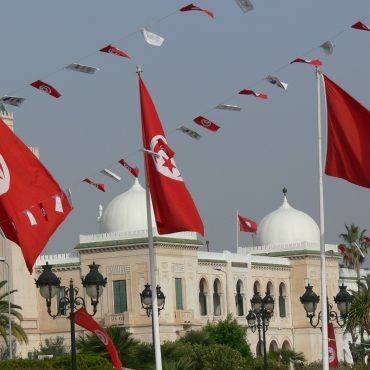 In January 2011, the World Economic Forum’s Global Competitiveness Index identified Tunisia as Africa’s most competitive country, only to witness shortly thereafter massive protests and the abdication of the country’s presumably firmly seated dictator, Ben Ali. Egypt attracted considerable praise from organizations such as the World Bank in its 2008 Doing Business report for the economic reforms pursued under President Mubarak, but the widening income gap between the poor and wealthy, together with growing public ire against despotism, drove outraged citizens to demonstrate at Tahrir Square. Genuine stability involves the resolution – not the repression – of conflicts. The importance of this kind of stability is captured by the BTI’s “cleavage/conflict management“ indicator, which examines the extent to which governments in 129 developing countries are capable and willing to depolarize or even resolve political, social, ethnic or religious conflicts. The BTI’s sobering findings in this matter show that more than one-half of the surveyed governments either prove unable to preclude conflicts or actually fuel conflicts themselves. But that’s not the worst of it: in the last ten years, moderating and depolarizing conflicts has suffered the greatest losses among all indicators of good governance. Several governments are more efficient, goal-oriented and better coordinated – but when it comes to conflict management, only 20 states show any improvement. Far too few when compared to the whopping 57 states registering losses regarding this core component of consensus-building. BTI conflict management, BTI 2006 – 2016. The figure above illustrates this dilemma: in the BTI 2006 (with 118 surveyed countries), a good quarter of all governments were able to actively depolarize conflicts and another third were at least able to prevent conflicts from escalating. Together, these two groups accounted for 62%. Ten years later, only 18 of 129 surveyed countries demonstrated the capacity to depolarize conflicts and just over 30% could prevent conflicts from escalating. Together, these two groups now only comprise 44% of the total surveyed countries. Conflict management, and consensus-building more generally, function much better in democracies than they do in countries with authoritarian governments. Of the 40 countries where governments do the best job of moderating or de-escalating conflicts, only three of them are autocracies: Qatar, Singapore and the United Arab Emirates. Arab countries, in particular Bahrain (-6 on a ten-point scale), Libya and Syria (both -5) and African countries such as Eritrea and Mali are characteristic of this trend. A positive counterexample is the small West African state of Benin. 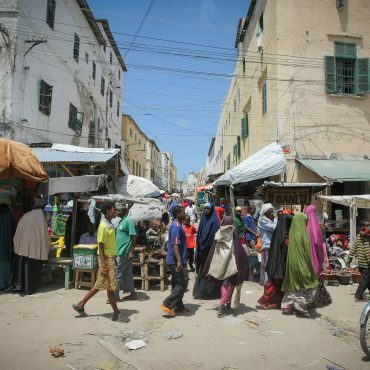 Highly fragmented in terms of ethnicity and religion, the country’s various latent conflicts are mediated peacefully, a process anchored in repeated references to national unity, solidarity and an appreciation of constitutional stability. 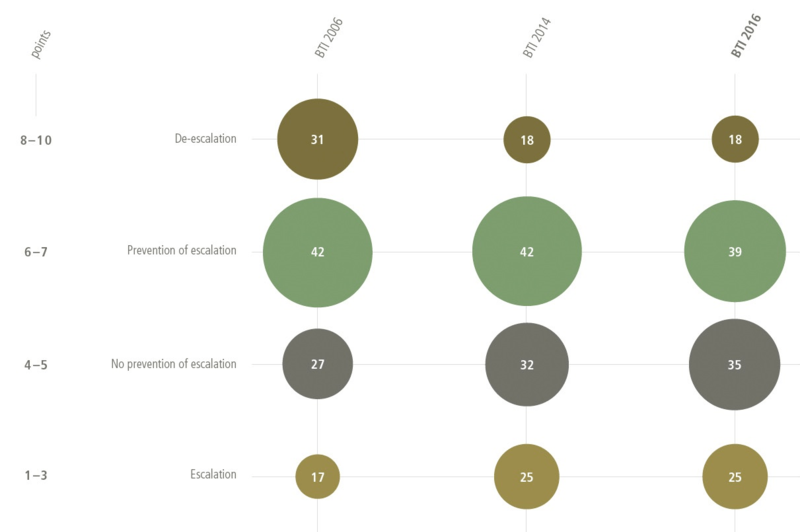 Next to Uruguay – a model of democratic good governance – Benin is the only country to have received 9 out of 10 points possible for conflict management in every BTI survey over the last decade. 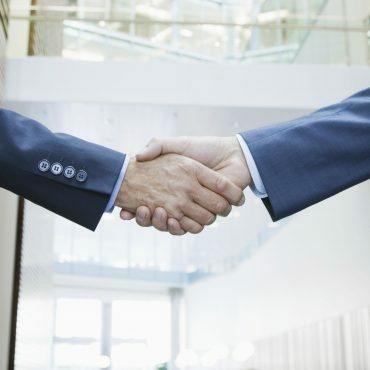 Legal certainty is another key factor topping the list of priorities when making investment decisions. How well protected are property rights and what role does the private sector play in the social fabric of the country under consideration for investment? The BTI has answers to these questions as well, as two of its 52 indicators assess these aspects of economic policy in the 129 surveyed countries. Overall, on global average, businesses are better protected from expropriation and arbitrary state interference (6.1 on a ten-point scale) than they are from escalating conflicts (5.3 out of ten points), though this trend is scaling back somewhat. In the last ten years, property rights protection has improved in 44 countries but worsened in 49. Characteristic of this trend is Zambia (-3), where a few previously privatized firms have been re-nationalized and compensation payments delayed. This kind of development is common across South and East Africa in a context of diminishing legal certainty (falling from 5.9 in the BTI 2006 to 5.4 in 2016). 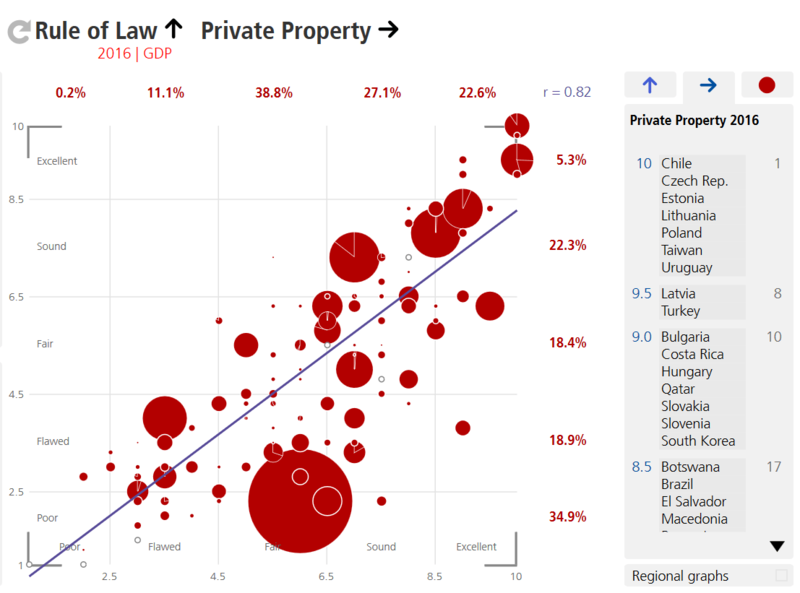 Correlation Rule of Law and Private Property, BTI Atlas. This dovetails with the argument that private property is much better protected in democracies featuring a sound separation of powers and independent judiciary than it is in countries with authoritarian governments. 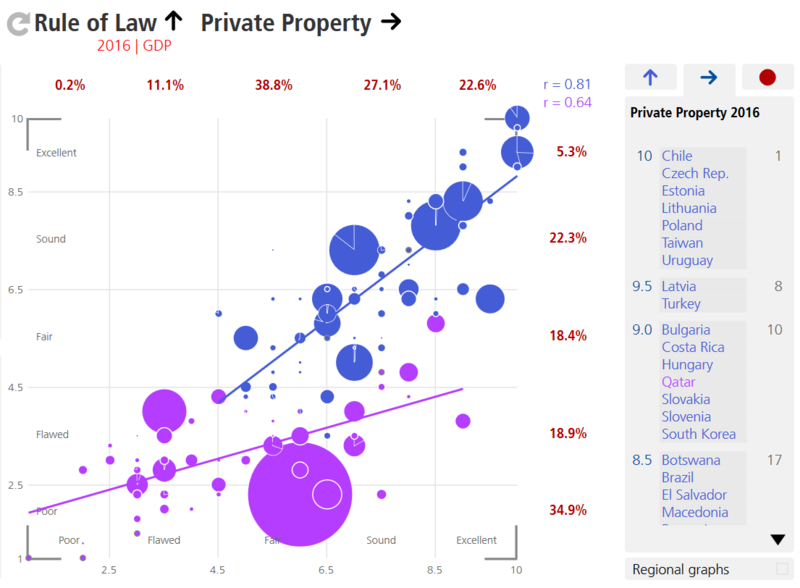 In fact, only a few autocracies (pink bubbles in the figure below) receive the highest marks (“excellent”) with regard to respecting and protecting private property: Qatar, which features a weak rule of law, and Singapore, which also receives high marks for its anti-corruption practices. There are key differences, however, between the world’s largest authoritarian countries. Whereas China fares ok in terms of private property protections (6.0) and poorly in terms of the rule of law (2.3), Russia is below average in both areas (3.5 and 4.0, respectively). By contrast, the model democracies of Taiwan and Uruguay, receive the highest scores possible (10) in both areas and are followed closely by Estonia. Turkey also receives high marks (9.5) in terms of property rights, but the rule of law has suffered under Erdogan’s leadership. Democracies may be more stable and feature greater legal certainty, but these factors alone are not enough when considering whether or not to invest. Determining this also requires a look at resource efficiency as well. Only those governments that make efficient use of the available human, financial and administrative resources can sustainably develop their economies and invest in infrastructure and education, thereby creating attractive conditions for potential investors. In assessing a country‘s resource efficiency, the BTI looks at the extent to which a government puts its assets to efficient use, how well it coordinates conflicting objectives into a coherent policy and how successfully it battles corruption. Among all the criteria for good governance, resource efficiency receives the lowest score on global average. For this criterion, the gap between democracies and autocracies is not as wide as is the case for conflict management and the rule of law. Three autocracies (Singapore, the United Arab Emirates and Qatar) number among the top 20 and another four (Malaysia, Rwanda, China and Jordan) among the top 40 scorers for resource efficiency. Yet once again, democracies score on average (5.6 points) much better than the autocracies (3.7). The ten most efficient governments – excepting the top-scorer Singapore – are democratically elected and found in every region of the world. They include countries as diverse as Botswana, Chile, Estonia and South Korea. These countries are not only efficient, but demonstrate greater sustainability in their economic pursuits. 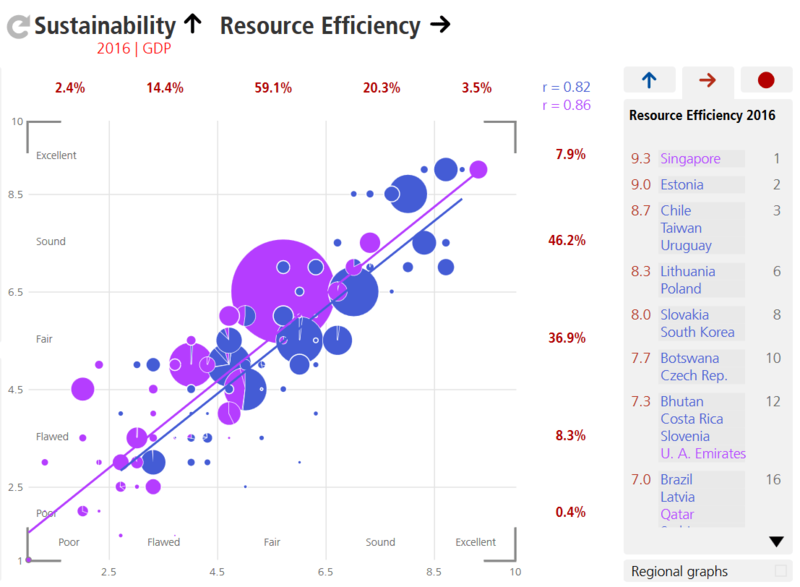 Correlation Sustainability and Resource Efficiency by Regime Type, BTI Atlas. The findings for battling corruption are similar. Only the region of East-Central and Southeast Europe – where there are no autocracies – shows overall positive scores. On the whole and with only a few exceptions, the fight against corruption is losing ground in the other BTI regions. A mere 30 countries have proven capable of installing somewhat effective integrity mechanisms (receiving a score of 6 to 9 points). Governments in the majority of countries are either only partly willing and able to implement anti-corruption mechanisms or simply fail wholesale to battle corruption. Unsurprisingly, among the BTI’s governance indicators, anti-corruption policy receives the lowest global average score (4.35), and is particularly weak in Africa, the Middle East and, most prominently, in Post-Soviet Eurasia. Singapore is the only autocracy featuring effective integrity mechanisms. More stability, greater legal certainty and more efficient governance, these conditions attractive to potential investors are found more often in democratically governed countries. The decision to invest in democracies is not simply a matter of morals, it is frequently the most rational business choice. Exceptions such as Singapore do not disprove the overwhelming evidence in favor of investing in democracies. Focusing on short-term gains and ignoring labor rights or environmental standards can soon prove bad for business – as the case of China so clearly shows. 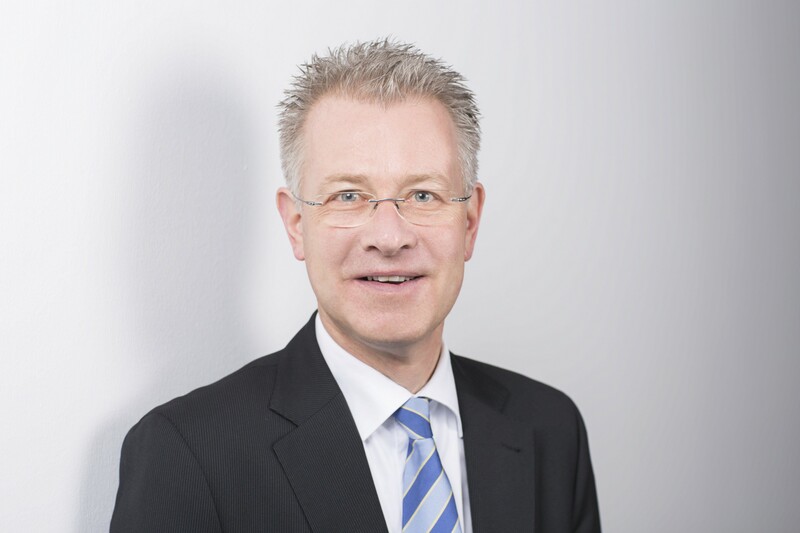 Dr. Hauke Hartmann is Senior Expert at the Bertelsmann Stiftung and directs the BTI project “Shaping Change – Strategies of Development and Transformation”.